Have you ever seen your dog or cat become fidgety, anxious and hyperactive when there are fireworks or a thunderstorm? Your dog or cat may start breathing heavily, bark or meow consistently with wide eyes. If so, your pet may have loud noise phobia. Pets with loud noise phobia may either try hurting themselves or cause damage to nearby property and environment when in distress. This may also be a reason why your pet may often runaway from home. It is better for you to recognize these symptoms early on for an intervention. Noise phobia tends to get worse overtime. It may start off as just a fear of extreme noises. Your pet may then be startled by any sudden noise if the condition is not taken care of at an early stage. This is because your dog or cat has extremely sensitive hearing. They can hear much higher frequencies than humans. Just imagine, if a firework sounds loud to us then what does it sound like to our pets? No wonder they get scared and develop a fear of it. Noise phobia may also be caused if your pet has separation anxiety or isn’t that social. Often times, when we see our pet anxious or worried, we try to comfort them by petting or hugging. However, this only ends up increasing their anxiety in such a stage. Pets cannot tell the difference between your concern for them and you being scared for yourself. They may interpret the action wrongly. What you can do is try playing a game with them, being relaxed, make sure your body language is playful and active. Your pets are intuitive and they often react according to the way we react around them. 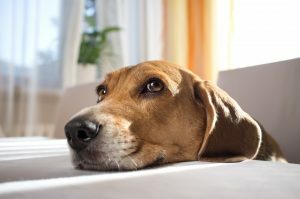 If your pet has loud noise phobia or any kind of anxiety, make an appointment with AV Veterinary Center to see if there are any appropriate medications that could help your pet. Such medications may help your pets sleep for long periods until the storm passes or the fireworks are over. Be patient as in such situations your pet may not respond to the behavior tricks you’ve taught them. Pets may like to retreat to dark and cozy places to hide when feeling scared from a loud noise. You can assist them by creating a den for them in a soundproof room. Provide them with soft chew toys, snacks and water, a comfy pillow, mat or bed. You can even play some soft and comforting music to keep your pet distracted. If music doesn’t sit well with your pet turn on a loud fan or the television. Make sure your pet is in a room where humans are nearby. Make sure the sound-proof room you’ve chosen has no windows. If it does, cover it up with a cloth or foam. To learn more about how to keep your pets in calm when there are loud noises nearby, contact AV Veterinary Center today!